The European Union (EU) has voiced concern over the slowdown in the progress of the government’s far reaching reforms and its commitments made to regain General System of Preferences (GSP +) facility. 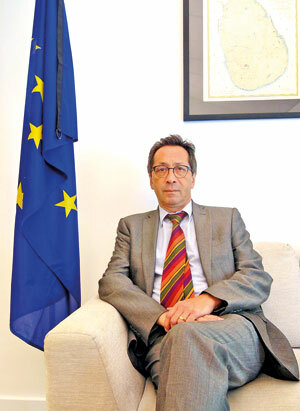 There was a significant acceleration in fulfilling major obligations under GSP + during the early period of the good governance government which took office in 2015, but it has retarded during the recent past, EU Ambassador in Sri Lanka Tung-Lai Margue told the Business Times. The Government has set out a programme of major reforms to address reconciliation and accountability, democracy, the rule of law, better governance and economic development in accordance with its commitments made to the EU. A key development in the EU-Sri Lankan trade relations was the re-grant of GSP + to Sri Lanka by the EU in May 2017. GSP + provides duty free access to the EU market for Sri Lankan products on 66 per cent of the EU tariff lines representing around 6000 products, he disclosed. The government has taken steps to ratify and implement 27 UN conventions on good governance, human and labour rights, and the environment in order to re-enter the scheme. Sri Lanka will be subjected to stringent monitoring mechanism of the EU on the government’s efforts to meet the requirements to reap GSP+ benefits in the first or second quarter of this year. A team from the European Commission’s Trade Directorate-General will review the current status in the implementation of 27 UN conventions on good governance, human and labour rights, and the environment in order to continue the scheme. The team will submit their report to the European Parliament and Council of Ministers for its assessment of the overall implementation of the 27 international conventions applicable to GSP +. More concretely, the team will assess whether there have been improvements since the last monitoring report and if the trend remains positive, he pointed out. The political impasse that engulfed the country for 52 days had an impact on the business community and foreign investor sentiment as well as activities of EU delegation in Colombo. “We have to catch up the lost time,” Ambassador Margue said. The EU delegation had been putting on hold the projects that were in the pipeline for implementation in Sri Lanka but the ongoing projects have been affected in a limited manner by the political crisis, he revealed. However the EU is now moving forward to speed up the implementation of ongoing and the preparation of new programmes, he added. Referring to EU’s financial commitment to Sri Lanka, he disclosed that it has disbursed Euro 880 million during the past 15 years and it has provided Euro 760 million (Rs.123 billion) for development projects in the past 10 years. This shows the strengthening of EU-Sri Lanka relations in the recent past, he said while welcoming the peaceful and democratic resolution of the political crisis in accordance with the Constitution. He commended the resilience of Sri Lanka’s democratic institutions and will continue to support its efforts towards national reconciliation and prosperity for all. Sri Lankan exports to the EU have increased by 18 per cent in the first year after regaining GSP +. Fisheries exports in particular were up by 100 per cent. Other notable growth sectors included clothing, tea, tyres, gems as well as motor vehicle parts and footwear. He noted that higher quality products and following ethical and sustainable practices are necessary to becoming key strengths for Sri Lanka. The EU Ambassador expressed the belief that concessions under GSP + will trickle down to Sri Lanka’s rural workforce, developing their livelihoods and raising income levels. In order to fully exploit the potential of GSP +, Sri Lanka must diversify its export products and target more EU member countries beyond the traditional ones and other regions, Ambassador Margue said. The GSP utilisation rate is still relatively low at only 55 per cent in 2017 he said adding that it was even lower for clothing, at 43 per cent. The EU-Sri Lanka Trade-Related Technical Assistance project launched in 2017 is aimed at increasing the trade competitiveness of Sri Lankan Small and Medium scale Enterprises (SMEs) in the region, in particular SAARC, and European Union (EU) markets. The four year EU funded project, contributes to Sri Lanka’s inclusive trade-led growth and regional integration, he pointed out adding that necessary assistance is being provided to SMEs to overcome obstacles in entering EU and SAARC markets. In addition to diversifying its export products, it is also important for Sri Lanka to diversify the European and SAARC countries it is exporting to, he emphasised. At present the UK accounts more or less for 1/3 of Sri Lanka’s exports to the EU. Even with the departure of UK with Brexit, there will still be 27 countries in the EU, with the prospect of more joining later, he claimed. A District Development Project had been implemented with EU assistance of Euro 60 million in collaboration with five UN agencies plus IFC supporting poverty reduction, provision of basic infrastructure and services for vulnerable populations. It has extended assistance towards local economic development; and strengthening of the local governance, he revealed. Under the second part of EU assistance several reconciliation and good governance initiatives have been planned accordance with the coalition government’s objectives. A Euro15 million project towards the strengthening of reconciliation process is now underway involving, non-government and grassroots organisations to take joint responsibility in addressing key elements of the reconciliation process as well as institutional capacity building and reduction of language barriers.